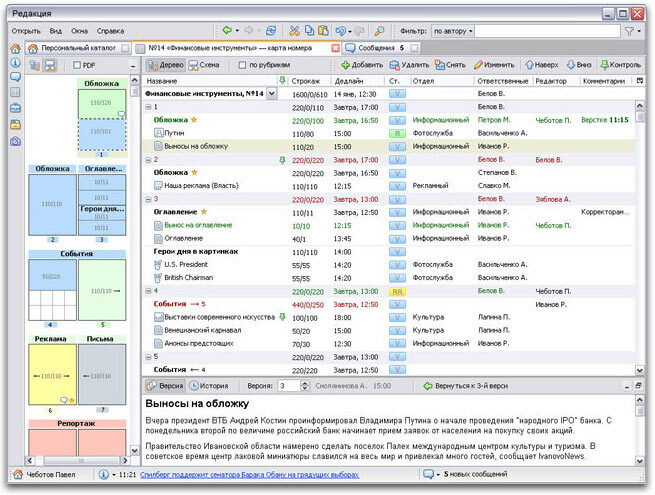 Problem: Develop editorial system user interface. Editorial and publishing systems are designed to enable flexible flow production in periodical publishing. Convenient editorial software is essential for organizing work process and ensuring effective team performance. Kommersant Publishing House employs over 1500 people, who work every day to produce the newspaper of the same name, its supplements and a number of magazines. The system allows personnel to follow the publishing process from planning to going to press. It is integrated with MS Word and InDesign and Qwark Express page layout applications. The problem with most editorial systems is that they are specifically designed for making either newspapers or magazines. Unlike them, this system with a range of issue map options allows producing both. 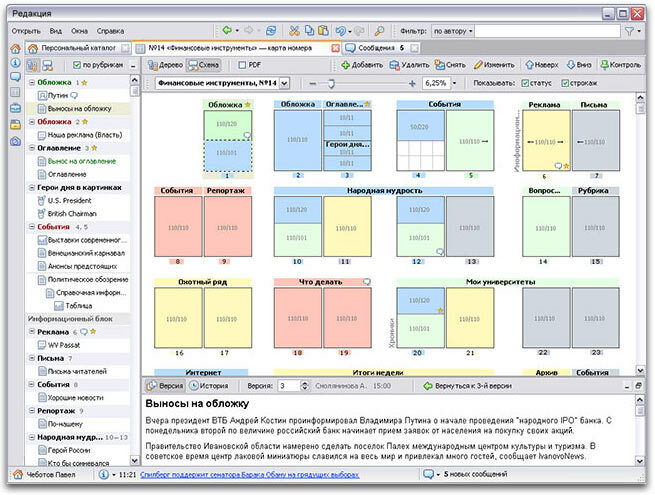 Design of the interface elements is similar to that used in publishing-related software products, such as common text editors, browsers and e-mail agents, which makes it easier and faster to learn. 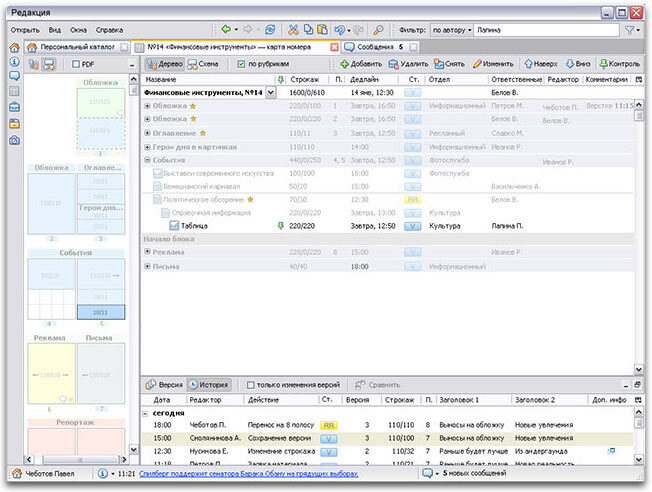 It is the main module meant for production planning. It contains the structure of the whole issue with a list of featured articles. For each item there is a person in charge, size, accompanying graphic materials and deadlines specified. 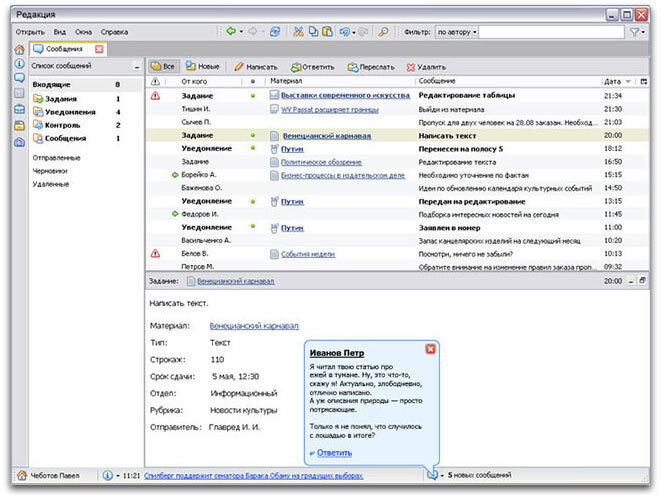 Issue Map is used for assigning editorial tasks and enables to follow the progress. 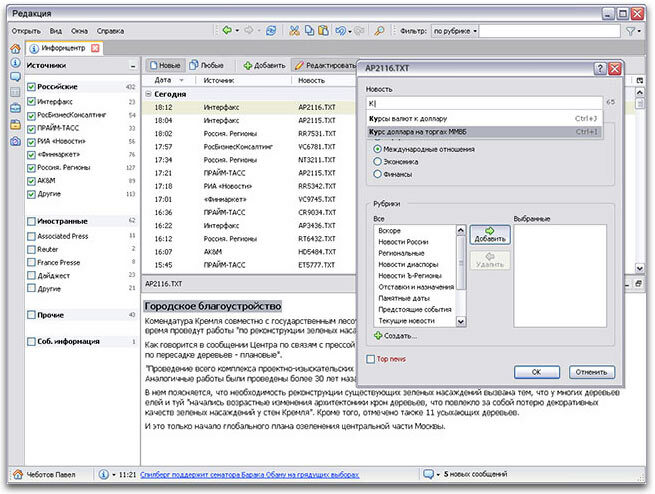 This module serves the purpose of organizing and filtering news flows incoming from numerous international agencies. These are used to inform workers of the tasks assigned, to communicate with other users or the system. This is a module for storing suspended materials, something laid aside to appear in the next issue as it can’t fit into the current one. It comprises all materials submitted by user. It is also here that article drafts and important notes are stored. This archive contains issue maps and all the materials published in one or several periodical publications. It’s a helpful tool for staff handling photographic materials that allows them to search a great number of sources for topical images. First, there is an editorial board meeting. As a rule, the board includes chief and issuing editors, department heads, issuing assistant, and responsible secretary. They decide on the coming issue’s topics and coverage. Results of the meeting are used to draft the issue map. It should include sizes and positions of all materials. It is worth mentioning that production planning methods for newspapers and magazines differ. Newspapers usually have a fixed number of pages and use multi-column layouts, whereas the number of magazine pages may vary from issue to issue, and page layout depends on the section. Meanwhile, advertising department staff fill the Issue Map module with ad blocks. Advertisers really care about how their ad is placed on a page or in which section it is published. Then, editors or department heads assign specific tasks to personnel. It often happens that preparation of a single article requires several specialists to work together—journalists do the writing, Information Center staff search and collect the necessary information, and photographers and artists create and submit images. All of this is also added to the issue map. When drafting the issue map, the board is supposed to set all the due dates critical for the periodical. For example, deadlines to hand the materials to editor, corrector, or imposer; or the amount of time imposer is given to prepare the draft issue; or the final mock-up deadline. Deadlines are of tremendous significance, especially with newspapers when every minute counts. Issue Map shows who is working on the issue and what tasks are completed at the moment. The tree structure clearly shows you the hierarchy of materials, nested blocks and sections, due dates, and people in charge. Marked in red you see the materials being prepared by other workers, and you own tasks appear green. Such color indication is important, as no one is supposed to change materials assigned to someone else. To track certain materials (make sure you see when they are ready or pass to another stage of preparation), you need to mark them in the tree. Easy-to-use progress control tool is particularly valuable in preparing newspapers. The chart demonstrates the issue map according either to its logical structure (blocks or sections) or to actual pages. The graphic chart demonstrates position of text, ads and images, and their current status. If a page is already made up, it is shown in PDF format. You can easily see spaces available for adding new articles and unoccupied spots for placing advertisements. This feature is highly useful for producing magazines when it takes several weeks to collect all the materials. We combined advantages of both representations by introducing an option to view the tree and graphic chart at the same time. One view appears in the side panel, while the other occupies your work area (and you can switch between them if necessary). Issue Map is integrated with your text editor. It shows in the bottom work area, but may also be opened in a separate window. To avoid losing data and allow editors to monitor the progress, there is a file history feature. It stores all the changes, the time they were made and names of the workers responsible for them. Preparation of articles for publication is impossible without access to factual or reference information and the latest relevant news. Information Center is a place where all of this is kept well organized. You can choose the categories, topics or sources you need, and view the corresponding materials. There is an option allowing you to create your own categories using necessary criteria (in a way similar to making a search request). And you can also select several news pieces for viewing in a single window. News sources are displayed in the left column. Editors mark only the sources they work with. Beside the name of the source you can see the number of raw news. You can view either all current source news or only new, or raw, pieces (regular mode). Selecting a text fragment and pressing the Edit button transforms this text into the heading for this news. You are allowed to type any heading without selecting text. In this case, you are given some suggestions from the standard headings list that can also be reached by pressing the shortcut key combination. 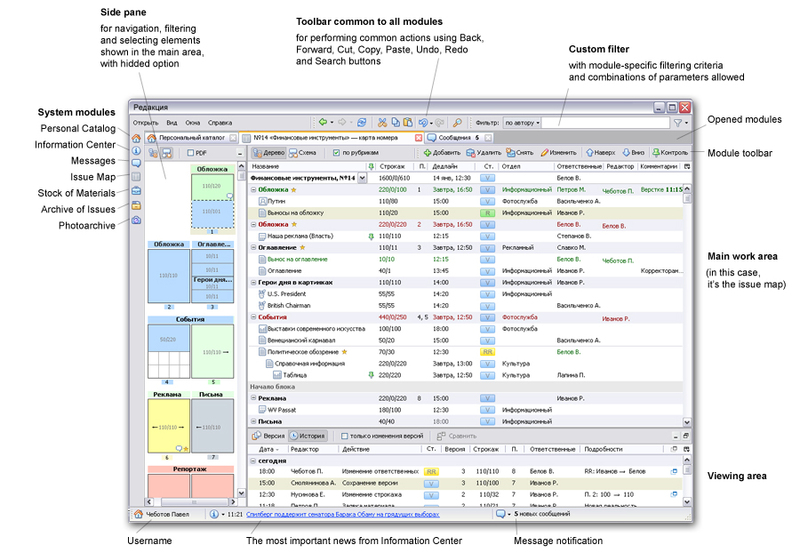 Messages include editorial tasks, inter-user communication, reminders and system notifications. Most of them are linked to some object in the system and can take you to that object or allow you to change its status. While developing the interface, we paid much attention to its small, but often used elements, such as filters. Editorial staff constantly work with large amounts of information using Issue Map, archives and Info Center, and effective filtering plays significan role here. Filtering feature can be found in the upper right corner of any module. Depending on the module, you can use different frequently used parameters. We’ve noticed that there are sets of filters regularly used by certain specialists. For instance, Advertising Department staff most of the time fish for ad blocks, department heads tend to look at the materials concerning their department, editors need to know what is ready for editing, etc. For this reason, recently applied filters are saved and can be later used by default. Working with certain modules (for example, Issue Map), you might need to see the whole structure, so filtered-off items are not hidden, but dimmed.